Did you know that, if left alone, sheep grow just enough wool to insulate themselves against extreme heat and cold? “Freeing” sheep from their heavy coats is a myth. In fact, the wool industry thrives on abusing these gentle, sweet animals from the time they are just babies. Most wool comes from Australia, where lambs have their tails docked and their ears punched with tags within weeks of birth. Male lambs are painfully castrated, sometimes with clippers, and never with painkillers. Many lambs die within the first few weeks of their lives from neglect or starvation. Merino sheep, which are prevalent in Australia, are bred to have wrinkly skin that makes them susceptible to fly infestation. To prevent this, farmers use a method called “mulesing,” cutting large pieces of skin from the sheep’s backside without anesthetic. Shearing itself is a bloody and painful process with no respect for the sheep’s life. Shearers are paid by volume, so they rush to shear as many sheep as possible. Investigations have revealed workers cutting or ripping off parts of the sheep’s body and using thread and needle to hastily stitch up wounds. PETA found shearers in Australian farms punching, kicking, and standing on sheep. They even reported someone hitting a lamb on the head with a hammer. After years of cruelty and neglect, sheep are ultimately shipped to slaughterhouses. If they survive the journey, they will have their throats slit, many while still fully conscious. With the amount of fashionable, functional clothing alternatives to wool and animal skins, there is no reason to support this cruel industry. Sheep are affectionate, intuitive animals who feel pain and loneliness. 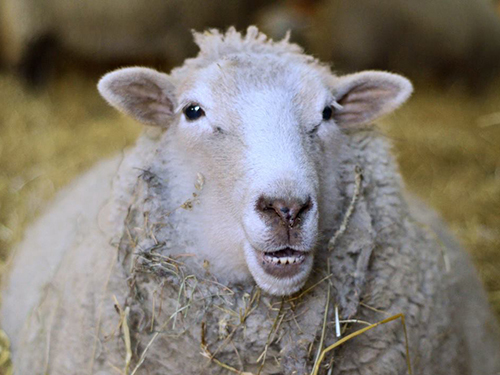 Recent research shows they can recognize changes in facial expressions in both humans and other sheep. They express anxiety when separated from their flock and playfulness when they are happy. Learn more about these unique animals.